The game begins thirty years after World War III, which begins after an explosion of unknown origin destroys the city of Tokyo. Kaneda and members of his motorcycle gang are chasing members of a rival gang known as The Clowns. Tetsuo was out in front on his bike when an odd looking person appears in front of Testuo, and his bike explodes. Kaneda tries to help Tetsuo when an Army helicopter appears. The person that Tetsuo nearly crashed into, Takashi, is summoned to the helicopter. Then Kaneda and his gang are arrested by the Army. When they realize that Tetsuo is hurt, the Army collects him into the helicopter and takes off. You now sit before an Army interrogator who questions why you and your gang were present at that location. He suspects you may be part of a Terrorist organization. Talk: Talk to the interrogator. Kaneda will make up a story about seeing his deathly ill mom when the Clowns attacked his gang. The interrogator will be skeptical and inquire about your mom. Talk: Talk to him a second time to explain that your mom has recovered. The interrogator is still skeptical. Now you'll have the option to Laugh, but don't. Look → Gang: Look at various members of your gang. If you take too long, the interrogator will demand you return your attention him. 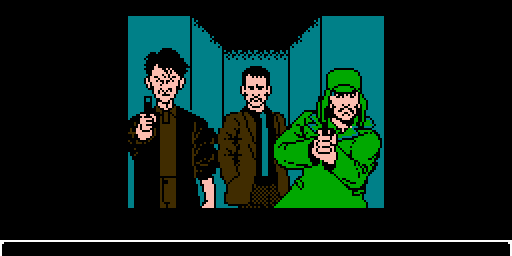 Keep looking at your gang, particularly Kaneda (center) and the two members to the left of him until the interrogator is convinced that you're not with the Terrorists. Peek → List: Try to look at the list, but the interrogator will insist that you stop. Peek → List: Do it again anyway, and you'll discover that it's a list of suspected Terrorists, including a girl who Kaneda thinks is cute. Inquire: Kaneda will ask what the girl's name is, but the interrogator just tells you to shut up. Inquire: Next Kaneda will ask where the girl lives, with the same response. Inquire: Kaneda begs for the girl's phone number, and the interrogator will insist they don't have it. The lackey will conclude that the gang has no connections to the Terrorists, and you will be told to wait outside of the room. You will be waiting on a bench outside of the interrogation room in a gymnasium. Check → Pick: Point the cursor at the one person on the right bench dressed in orange. Kaneda thinks he's seen her before. Check → Pick: Kaneda recognizes her as the woman in the interrogator's file and decides now would be a good time to try and ask her out. Ask out: Just when you do, a Terrorist pull a pin from his grenade. Note that any action you take at this point which deviates from the movie will cause you to die and end your game. Yell: Yelling is the only action which will enable the next action to work successfully. Take cover: Everyone will move as far away from the Terrorist as possible, and then the Terrorist's grenade will fail to explode. The Army will tackle him and begin to beat him. Kaneda's gang is free to leave, but Kaneda will wonder if he can rescue the girl as well. Look → Army: Kaneda notes that they are holding the Terrorist's grenade. Talk: Kaneda will call one of the Army men "Gramps" and inform him that the girl is with his gang. The Army man will be insulted, and throw you and the girl out of the building. Kaneda will try to hit on the girl, but she isn't impressed. Kaneda will try to convince her that he's interested in her for more than just her looks, and the girl will thank Kaneda for helping her. Kaneda will introduce himself, and then the girl will say goodbye. An explosion in the background suggests that the grenade wasn't a dud after all. Back at school, Kaneda's gang suffered through punishment at the hands of the P.E. teacher "Jaws". Groupies of Kaneda's gang will inquire about The Clowns. Kaneda will mention Tetsuo's accident. Kai figures he's in some hospital, and then he notices Tetsuo riding on Kaneda's bike with some girl. Kaneda jumps on Yamagata's bike to chase after Tetsuo. To find Tetsuo, they starting by checking out the bar his gang hangs out in. 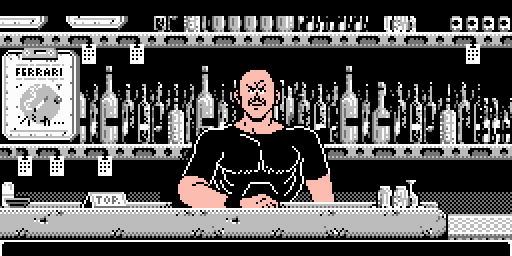 Peek: You will notice that the bar tender is hiding pills under his right hand. Inquire: The bar tender will inform you that Tetsuo headed to sector X, where X can be any number from 1 to 4. Note what X is. Kaneda will ask if he can have the pills the bar tender is hiding. Move → X: Choose to move to the numbered sector that the bar tender mentioned. As long as you choose the correct sector, the path forward will be the same even if the scenery is different. You have a couple of choices, but only one command matters. You will have to repeat this process as many times as it takes until you reach sector 4. Inquire: Whoever is present will inform you that Tetsuo went to sector Y, where Y is again a number from 1 to 4. Move → Y: Choose to move to the numbered sector that was just mentioned. Eventually, you will successfully arrive at Sector 4. Yell: This step is entirely optional. If you do, a man will tell you to go away unless you have pills. Show: The man will be interested in the pills you have. Show: The man will thank you for the pills and notices that you're looking for someone. Inquire: The man reports that Tetsuo headed towards the factories. 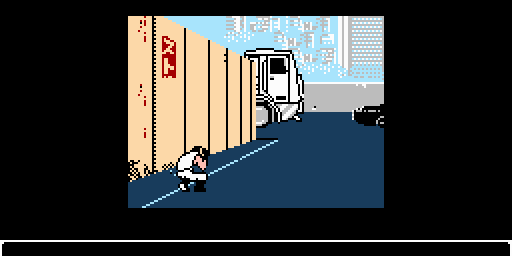 You now chase after Tetsuo near the factories, where you find them being attacked by The Clowns gang. 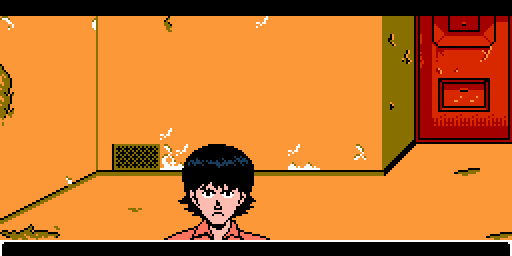 Kaneda jumps off his bike to confront the assailants. 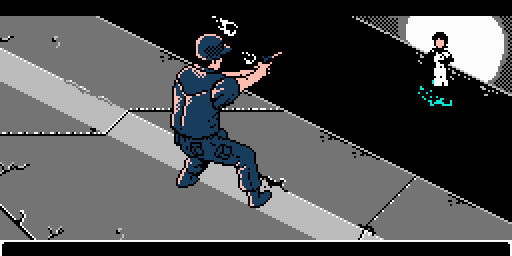 Crouch: This is the only option that does not result in you getting hit by the pipe swung by the gang member. Run: Again, choosing any other option will result in you getting hit and ending the game. As a result of running, Kai comes to your rescue and strikes the gang member with his iron pipe. Having saved Tetsuo, Kaneda's gang surrounds The Clowns. Tetsuo flies into a rage attacking the gang member who attacked the girl he was with. Kaneda tries to reason with Tetsuo to stop before he kills the gang member. Tetsuo admits that he does want to kill him, and Kaneda tells him to knock it off. Tetsuo doesn't appreciate Kaneda's tone or his help and insists he could have handled it on his own. Then he storms off just before a terrible headache causes him to grab his head in pain. He yells out the name "Akira" and begins to have psychic visions of him. Kaneda and Kai try to help, but then a black car and a Control Room Car (CRC) arrive on the scene. Look → Car: Kaneda will identify it as an Army car. Look → CRC: Kaneda will identify it as the Control Room Car. Look → Tetsuo: (Optional) Kaneda will cry out to Tetsuo. Run to: This option will only appear below "Panic" once you look at the Car and the CRC. At this time, men in lab coats exit the CRC and surround Tetsuo. They report their findings and the Doctor in charge insists they retreive him. They pick Tetsuo up. Look → Car: A man in black will step out of the car to protect the assistants. Look → Tetsuo: You will notice that it looks like they gave Tetsuo some kind of injection. Inquire: Kaneda will ask when the men meant by "subject". Inquire: Only after the previous three steps are performed will you hear the doctor refer to Tetsuo as "the experimental subject," as they bring him back to the CRC. Run to: This option only becomes available after you hear the doctor say that. 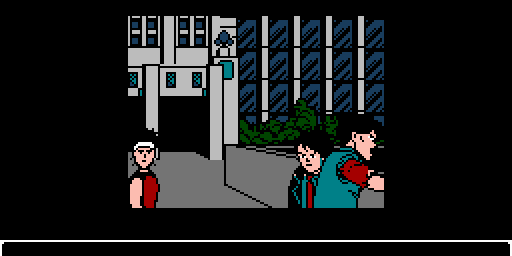 Kaneda tries to run to Tetsuo, but is blocked by the man in black. 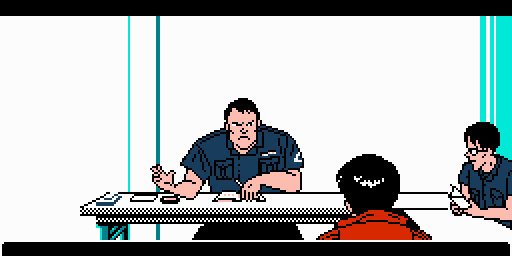 Look: Kaneda will inquire if the men are from the Army, but the man in black says nothing. Look: Kaneda demands to know where they are taking Tetsuo. Any option: Choose "Yell", "Hit", or "Run to". No matter what you choose, you will be knocked to the ground by the man in black, and The Army will leave with Tetsuo. Later that evening, Kaneda wonders where the Army took Testuo. Kai asks Kaneda what he's thinking about. Inquire → Kai → About Amry: Kai recalls that they referred to Tetsuo as an "experiment". Inquire → Yamagata → About Kid: Yamagata observes that the Army is treating Tetsuo similar to how they treat the kid. Inquire → Groupie → About Akira: Upon asking the groupie about Akira, she states that she's not interested in discussing that and insults the gang. Inquire → Groupie → About Tetsuo: She asks Kaneda if he intends to rescue him, and decides to leave. After the groupies leave, an explosion occurs nearby. Yamagata suggests it was the Terrorists and that they should check it out. Then Kaneda sees the Terrorists. Look → Terrorist: Kaneda sees 4 or 5 of them escaping the smoke and attacking the Army. Look → Terrorist: This time Kaneda recognizes the girl from before. Check: The Army chases the Terrorists. Inquire: Kaneda hears the Army claim they went towards the Sewers. Move → 2: Sector 2 leads to the sewers. If you go to sectors 1 or 3, you'll have a chance to move somewhere else, but if you visit sector 4, your game will end. A man in sector 2 will confirm that the Army chased a girl into the sewers. Kaneda follows. Inquire: Kaneda will hear a voice neabry. Peek: Kaneda will look and see the girl being held at gunpoint by the Army. Sneak: In the process of sneaking over the fence, Kaneda kicks the fence and alerts the soldier to his presence. This is the only option that will advance the scene. Talk and Ask out get ignored, and Make Noise or Hide result in the game ending. Dash: Again, this is the only choice that advances the scene. All the other choices end the game. Dive: Once again, any other choice will end the game. By diving at the soldier, Kaneda knocks both of them into the mud. Another soldier approaches with his gun drawn. The girl fires a weapon of her own and kills the soldier. Kaneda recommends they leave. He follows the girl. They escape the Army and arrive at a Terrorist hideout. Talk: Kaneda tries to hit on the girl, but she calls for Ryu. Talk: Kaneda tries again to engage the girl, but she calls out for Ryu again. Talk: Kaneda tries to ask her out, but she just calls for Ryu. Talk: After Kaneda tries to calm the girl down, he is held at gunpoint by other Terrorists. Ponder: Now you know the girl's name is Kei. Kaneda wonders about the other men. Check: You can check the guy on the left if you want, but don't check the guy on the right, or he'll shoot you. Check the guy in the middle, and Kaneda will recognize him from the walkway. Check: Check the middle guy again, and Kaneda will realize he's Ryu. Check: At this point, you can safely check either Terrorist, and the man on the right will ask who you are. Explain → Truth: You will explain what happened with Kei in the sewers. Rely on Kei: Kei will confirm your story. Check: In this room, you can actually turn 360 degrees. So if you keep moving the cursor to the right or to the left, the view of the room will scroll around in a circle. Check the boxes of beer in the room, they're near the bottom of the screen. Open → Beer: You will try to open the beer, but notice there's no bottle cap opener around. You'll need to find something to open it with. Check: Now look at the grate near the bottom of the screen to the right of the boxes of beer. Open: This time, you will be able to point to something instead of choosing from a list. Point to the grate and Kaneda will open it. Run: Kaneda will enter the grate. Go on: Kaneda will move forward. Inquire: If you did not tell the truth, Kaneda will hear voices, and they will run through the same dialogue that you would hear if you told the truth and were brought into the planning room with Kei. If you did tell the truth, but tried to take the Lab ID too early, it will just say that you hear the Terrorists talking. Go on: Moving through the air duct will give you away and a Terrorist will grab you out of it. A Terrorist will be pointing a gun at you. Talk: Kaneda will explain about Tetsuo. From here, play resumes normally. The terrorists discuss their plan to break into a lab with fake ID cards. They identify the lab as a center for human experimentation. You will have choices, but if you choose to Take the Lab ID before you're permitted, you will be placed in the storage room explained above. Inquire → About Army: The Terrorists suggests that the Army is protecting human experimentation. Inquire → About Terrorists: Their aim is to expose the labs to the tax paying public. Ponder: Kaneda starts to connect the wrinkly kid that he saw the other night to what Tetsuo is going through. Beg: Kaneda asks to be taken along. Beg: He feels embarrassed about asking. Take → Lab ID: If you try to take this before Kaneda remarks about being embarrassed, you will get thrown in the storage room (see above). Otherwise, you will advance to the next scene. This section introduces another style of gameplay where the controls are a little different. Go on: The Terrorists explain their intention to block the central wiring system, when Ryu notices that security spotted them. One of the Terrorists is hit. You aren't given very much time to react. 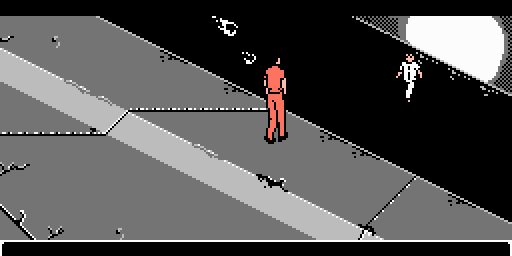 As soon as the instructions disappear, and security enforcer will be barreling down the tunnel and shooting at you. If you have time to place your cursor over him and fire, do so. Otherwise, be prepared to dodge the gunfire and turn around to return fire. If you do not see a hovercraft approaching you, you should turn around immediately, or you will be killed when they approach you from behind. It is best to shoot at them by leading the cursor to the left or right, depending on where they are flying. For example, if a craft is flying to your right, lead the cursor a little more to the right to improve the likelihood that your bullet will strike. After seven craft are destroyed, your gun will run out of ammo, and a hovercraft will fly right toward you. Dodge: Kaneda will jump out of the water and onto the sewer wall. Jump on: Kaneda will leap onto the craft. He will manage to take control of it and grab Kei to join him. Kei will indicate that the Army is present. At this time, the controls will be similar to a moment ago, where you can press A to fire at a location indicated by the curose, and press B to dodge. Army soldiers will take positions inside the tunnel and shoot at you. As you shoot various soldiers, activity on the Radio will indicate that Tetsuo has escaped from his cell and is approaching the nursery. Eventually, Kiyoko's face will appear as she telepathically communicates to Kei how to reach an elevator and find sublevel 8. Kaneda and Kei crash into the nursery. The scene in the nursery scrolls left and right, but not 360 degrees. There are many optional things to do here, but don't talk to the colonel, as that will end your game. Look: Move the cursor all the way to the right of the Colonel, and you'll find Testuo. Look at him and he'll ask why Kaneda is there. Talk → Tetsuo: Kaneda announces that he's there to save Tetsuo, but Tetsuo responds that from now on, he'll be the one doing the saving. Then he will telepathically shove Kaneda away and demand to know where Akira is. The mutant children indicate that he's buried under the Olympic Grounds. Then Tetsuo takes off, flying through a hole he makes in the ceiling. The Colonel announces is intention to catch him and destroy him. Call: Kei will appear before you, very upset. Inquire → About Army: Kei explains that the Army is afraid of Akira, and they must have locked his power away. Inquire → About Terrorist: Kei tells Kaneda that she thinks he's a burden to their cause. Inquire → About Terrorist: Despite that, you must ask her again. Kei explains that the Terrorists hope to bring down the Army's control if they can find Akira. Inquire → About Tetsuo: Kaneda asks if Tetsuo is trying to find Akira, and Kei confirms that. Inquire → About Akira: (This speech is taken largely from the movie script.) Kei explains that Akira is pure energy. She goes on to explain that humans have accumulated a lot of energy throughout history, compared to when they were just monkeys, going all the way back through evolution to single celled animals. Kei conjectures that even the air and space contain energy and memories about, and before, existence. Then she ponders what it would be like if an amoeba somehow possessed the energy of a human, suggesting it would consume everything around it. Kaneda considers that this must be what Akira and Tetsuo have become. Ponder: Kaneda now realizes that they are in trouble if they don't find Akira before Tetsuo does. Kei starts talking in a strange voice as she explains that the government started a research center, but their failure caused the destruction of Tokyo (the explosion which triggered the third world war.) Then all of a sudden the door opens up. Run: Kei and Kaneda leave the lab. Kaneda and Kei will return to the hideout, but when they get their, they find Kai standing outside afraid of something. Kai reports that he and Yamagata went to the bar where the gang hangs out and found the bar trashed and the owner dead. Tetsuo was there laughing, and wanted to know where Kaneda's bike was. Yamagata tried to talk to Tetsuo, and Tetsuo used his psychic powers to crush Yamagata's skull. Then he ran off with Kaneda's bike. Kaneda asks Kai for Yamagata's bike, and crashes it into the bridge wall as a symbolic gesture to send Yamagata's bike to him in the afterlife. Then he hears Kei scream, and looks down into the river. Look: Kaneda recognizes someone from the other night. Check: A kid approaches Kei from the water. 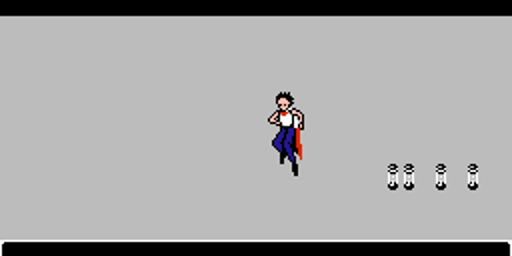 Run to: Kaneda wishes to run to Kei, but his body won't move. Run to: Kaneda calls to Kei, but Kai reports that they vanished. Run to: Kaneda hear's Kiyoko's voice saying that the power of Akira can exist in anyone, but that when the power awakens, one must choose how to use it. Kiyoko explains that Tetsuo is their newest member, and Kaneda asks why they took Kei. Kiyoko says they want Kaneda to help them, but he insist on getting Kei back and dealing with Tetsuo himself. Ponder: Kaneda wonders where Tetsuo went. Ponder: Kaneda says this is for Yamagata and his bike. Move → Town: In town Kaneda sees news reports about the Army heading to Olympic Grounds, and a single boy trying to fight back against them. The reporter encourages listeners to rise up against the Army, expressing anger over how the Army tramples on the freedom of the press. Move → School: Kaneda returns to the bike storage area and Kai asks if Kaneda is going to go by himself. Move: Kaneda heads to the Olympic Grounds. Along the way to the Olympic Grounds, Kaneda will find the aftermath of one of Tetsuo's attacks on some Army trucks. 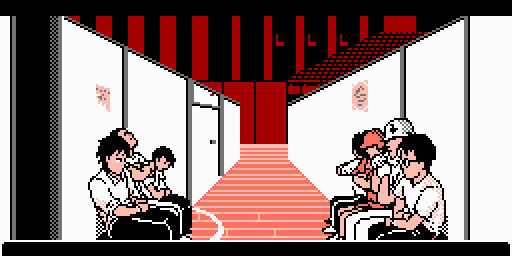 If you choose Go on from this scene instead of choosing to stop, you will proceed to the Olympic Grounds and end up in a one on one confrontation with Tetsuo that will unavoidably end up with the Kaneda losing to Tetsuo and ending the game. Stop: Kaneda stops his bike to get a closer look at the area. Check: Point to the gray gun mounted on the back of the blue truck on the right. Kaneda will identify it as a laser beam. Kaneda figures he can use it to beat Tetsuo. Kaneda grabs it and proceeds to the grounds. Once there, a large capsule comes into view, and Tetsuo and Kei are fighting above it. Kei is doing her best to contain Tetsuo's power. They both release power in the form of a shockwave, and Kei stops Tetsuo's. As soon as she does, she loses her power and falls. The capsule cracks open, and spheres roll around. Tetsuo asks what they are, and the Colonel explains that's all that's left of Akira. The Army tested and experimented on Akira's body after his powers awakened. The tissue samples are all that remain of Akira. The scientists could not come to understand Akira's power, so they stored all of the data and samples in the capsule for future generations to study. At this point, Tetsuo refuses to come back with the Army, and Kaneda climbs the rubble to speak with Tetsuo. Kaneda tries to talk Tetsuo down, but Tetsuo is insulted by Kaneda trying to boss him around, and begins to attack him. Use: You will only have this option if you checked the laser beam on the Army truck. Dodge and Jump on both lead to Kaneda's death. You must fire the laser five times. It doesn't matter if you aim directly at Tetsuo or not, he'll simply use his powers to deflect the lasers. On the fifth shot, the laser will lose power. NOTE: If you happen to shoot any of the vials containing Akira's remains on the lower right, you will activate the bad ending where Akira's energy resonates with the laser beam, bringing Akira back to life, and Akira commencing the destruction of Neo-Tokyo and the rest of Japan. Kaneda asks for a fair fight, and Tetsuo reports that he is beginning to understand the meaning of regret. A light begins to surround Tetsuo and grow. The Army fired down a giant laser beam from a satellite in space which they had launched as a counter measure in case Akira ever returned. Kaneda starts to run, and Tetsuo loses his arm to the beam. 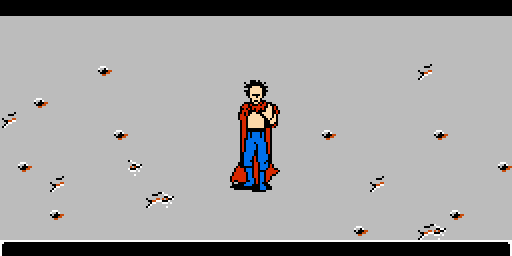 Kaneda then throws a large rock at Tetsuo. The Army tries to fire the beam again, but Tetsuo establishes a barrier. Tetsuo then launches himself into the atmosphere to destroy the Army's satellite. Kaneda runs through the rubble. Another beam starts to destroy the rubble, and Kaneda asks Kei to save him. Look: Be careful here, as many of the wrong choices result in death. By looking, you see Kei approach on Kai's bike. Yell: Kei and Kai will stop to rescue Kaneda. They manage to escape. The colonel notices the satellite has been destroyed by Tetsuo and marvels at his ability. The mutant kids discuss how they plan to intervene with Tetsuo. Meanwhile, Kaneda, Kei, and Kai take a break near a tollbooth. Ponder: Kaneda thinks about what Tetsuo is up to. Peek → Laser: Kaneda remarks how the laser broke just when they needed it. Inquire → Kai → About Bike: Kai wonders if there's a way to recharge the laser using the bike. Inquire → Kai → About Bike: Kai tries to connect the laser to the bike, but bike battery gets hot. Kaneda wonders if they should try two bikes, but Kai suggests they just use his. Peek → Kei: Kei offers Kaneda a mirror, and the Kaneda gets on his bike and speeds off. Kaneda holds the laser while driving back to the Olympic stadium. Tetsuo's arm has been replaced by a bizarre mass that is attacking the Army. Kaneda uses the laser against the mass. Then he squares off with Tetsuo. Look: Kaneda decides he's had enough of Tetsuo's attitude. Ponder: Kaneda remembers he has Kei's mirror. Look: The mass near Kaneda's arm is beginning to grow back. Hit: Aim the cursor not on Tetsuo, but on the mirror to his left. (Note: If you hit Tetsuo directly with the laser, the game will abruptly end with a "good" ending, but not the best ending.) The beam will bounce off the laser and hit the mass on his right arm. Tetsuo will cry out in pain, and the bounce into the air before beginning to dive at Kaneda. Kaneda throws his bike into reverse and backs up. Tetsuo attacks Kaneda. Kaneda decides to try and shoot Tetsuo again. Tetsuo collapses to the ground and begins to twitch. The laser hits Tetsuo's right arm. Tetsuo loses control of the energy and transforms into a monster. Tetsuo begs Kaneda for help. Look: Tetsuo will continue to lose control of his body. Note that if you choose Attack instead, you will get the bad ending described above. Jump: [Movie ending] The mutant children decide to sacrifice themselves to save you. A sphere of light envelopes and destroys old Tokyo. Kai and Kei watch on. Kaneda is floating through the light and relives childhood experiences, including when he first met Tetsuo. And he experiences the memories of the mutant children working with Akira. Kaneda hears Kei calling him, and he returns to her. The sphere grows and swallows Neo Tokyo. The area floods. When the episode ends, Kaneda sees a small glimmer of light which he grabs just before the light fades away. Kaneda reunites with Kai and Kei and they drive off to the ruins of Neo Tokyo. The Big Bang is retold, and a voice says, "I am Tetsuo." Run: [Short manga prelude] Kaneda decides to escape, and the mutant children teleport him away. The destruction of Neo Tokyo occurs as described above. Kei and Kai find Kaneda, but Tetsuo and Akira regain their physical form inside the stadium, and begin the despotic rule of Akira over Neo Tokyo. Hit: [Long manga prelude] Kaneda decides to try and strike Tetsuo, and he gets absorbed by the light. The destruction of Neo Tokyo occurs as described above and Kaneda experiences the flashbacks. However, without the mutant children's sacrifice, nothing controls the power inside the sphere. Kei and Kai find Kaneda, but Tetsuo and Akira regain their physical form inside the stadium, and begin the despotic rule of Akira over Neo Tokyo. This page was last edited on 29 March 2016, at 01:52.